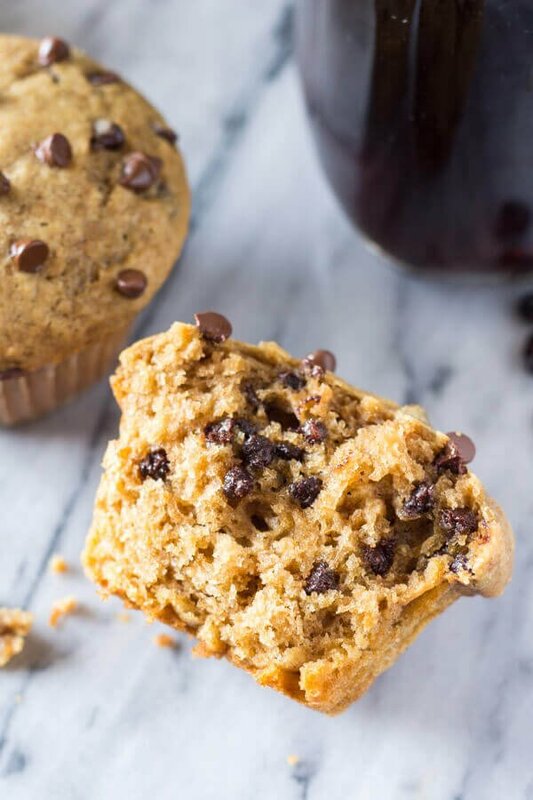 These Cappuccino Chocolate Chip Muffins are infused with delicious coffee flavor, ridiculously fluffy with the softest crumb, filled with melty chocolate chips… and the perfect way to get your morning coffee! There are very few things more comforting than waking up to a muffin & coffee. Whether it’s Monday morning and I’m dreading the realities of the week ahead, or it’s Sunday and I’m lazily eating breakfast and debating when/if I’ll get out of my pajamas… at noon. Caffeine and mini breakfast cakes are my favorite morning comfort food. There’s just something about warm, fragrant coffee and super soft, fluffy, chocolate filled muffins that can lure me out of bed. 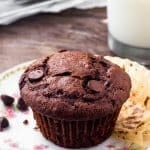 Now, I love my Chocolate Chip Muffins and Double Chocolate Muffins – but the idea of combining coffee with chocolate chip muffins got me thinking. 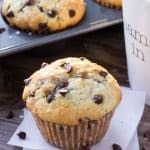 Could I make a coffee-flavored chocolate chip muffin? After some careful consideration, the answer was obviously yes. And these Cappuccino Chocolate Chip Muffins are the amazing result. They have a fluffy, super soft muffin crumb; delicious cappuccino flavor; and are filled with tons of chocolate chips. Heaven. I think you’ll agree – these meet ALL those delicious characteristics. So let’s talk about why. First, we’re using oil instead of butter. Because oil is liquid at room temperature, it gives baked goods a super soft crumb. Vanilla muffins & cakes need butter for flavor, but because these muffins are infused with delicious coffee – we don’t taste the butter flavor anyways. Then the other secret weapons for soft, fluffy, perfectly moist cappuccino muffins? Sour cream & buttermilk. The combo creates the best texture. Now, even with the best ingredients you can end up with tough, hard muffins. Muffin batter is very thick and only needs to be mixed until just combined or else your muffins lose their fluffy texture and soft crumb. Before getting started make sure your eggs, sour cream & buttermilk are at room temperature so it’s easier to mix the batter. Then we’re baking our muffins at a higher temperature for the first 5 minutes to really get that baking soda & baking powder working. The high temperature makes your muffins grow tall and get those perfectly domed muffin tops. And turns your kitchen into the ultimate muffin making bakery. Now, there’s absolutely no shortage of chocolate chips in these muffins and I wouldn’t have it any other way. With these super moist cappuccino chocolate chip muffins – your morning just got a whole lot better. 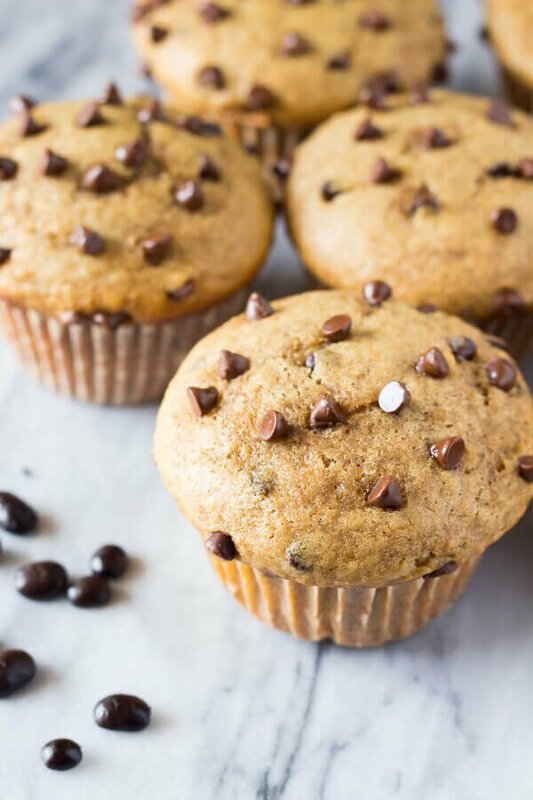 These Cappuccino Chocolate Chip Muffins are infused with delicious coffee flavor, ridiculously fluffy & super moist, filled with delicious melty chocolate chips & the BEST way to get your morning caffeine fix! Preheat the oven to 425F degrees. Line a muffin pan with muffin papers, or grease and flour each cavity. You'll end up with about 14-15 muffins total. In a large bowl whisk together the flour, baking powder, baking soda & salt. Set aside. In a separate large bowl beat the oil and sugars together using an electric mixer. Add in vanilla & eggs and continue beating until well combined. In a liquid measuring cup or small bowl, mix together the sour cream, buttermilk and instant coffee powder. If it doesn't completely dissolve, that's ok.
With the mixer on low speed, beat in about 1/2 the flour mixture followed by 1/2 of the buttermilk mixture. Turn off the mixer and fold in the rest of the flour, buttermilk and chocolate chips using a large wooden spoon or rubber spatula. Be very careful not to over mix your batter. Having a few lumps is ok.
Spoon the batter into your prepared muffin pan, filling each to the very top. You should end up with about 14 -15 muffins. Bake in the preheated oven at 425F degrees for 5 minutes. Then, without taking the muffins out of the oven, turn the oven down to 375F degrees and continue baking for about 12-15 minutes, or until an inserted toothpick comes out clean or with a few moist crumbs. Love, love, love these muffins. They were so soft & had the most delicious coffee flavor. Definitely saving! They were really excellent! I might chop up a bar of bittersweet chocolate next time, instead of using chips. I was dissappointed when the chips melted. Did you put the mini chips on top after they came out of the oven? 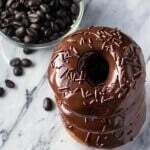 I might try making these in my large muffin size pan great thank you gift. These muffins are delicious! I used dark chocolate chips and added more than the recipe calls for and oh, my! I will definitely be making more.